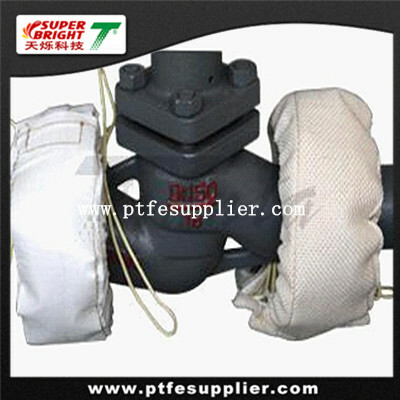 PTFE Flange Protector are used to prevent injury to personnel or damage to equipment in the event of a leak or spray-out of acids, caustics, chlorine and other dangerous liquids at piping connections (such as flanges, valves, or expansion joints) found in chemical, pulp/paper, petrochemical and wastewater treatment plants. These PTFE Flange Protector are commonly referred to as flange guards, flange covers, flange diapers or flange protectors. Our Safety Spray Shields are constructed from 100%PTFE Fabric ,PTFE Coated Fiberglass Fabric, PTFE Coated Kevlar Fabric, polypropylene Coated Silicone Fabric, PVC Coated Silicone Fabric, polyethylene Coated Silicone Fabric and are used for preventing spray-out of hazardous chemicals due to gasket or packing failure on flanges, valves and expansion joints. Our plastic cloth shields are manufactured from single and multilayered clear cloth for easy visibility or a colored cloth with a leak indicating patch. Weep holes located behind the sensitive pH indicating patch allow the indicator to immediately signal a leak and change color to red in the presence of an acid or green if an alkali. The pH patch is also replaceable which allows reuse of the shield. APS shields are UV stabilized and resistant to sun, rain, and fumes and may be used indoors or outdoors. Our cloth shields are quickly and easily installed by one person without any tools by means of a Velcro fastener and drawstrings which are standard. Cloth shields available in five different materials and eight various styles. Available for all standard 50mm ~ 300mm flanges Shields. Our most popular and best selling shield. Similar in design to standard PTFE shield. Same quality construction except single-layered for less severe applications. Similar in design to standard PTFE shields. 100% clear PTFE strip in center of shield allows for visual inspection.